Taylor Swift knows how to warm up even the coldest winter days with her sweet red lip! T-Swift's signature scarlet pout adds a festive flair to any look during the holidays! Read below and we'll help you perfect the pop star's red lip look! Taylor Swift, 25, rarely walks out of her New York City apartment without her best accessory: her sweet red lip! 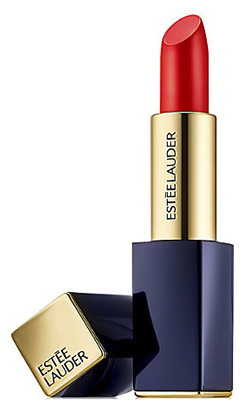 For those intimated by Tay's timeless red lips, the holidays are the best time to try a bold, classic lipstick. After all, 'tis the season to make a makeup statement! It's as though Taylor woke up with red lips - she makes it look so effortless and you can too by applying Estee Lauder Pure Color Envy Sculpting Lipstick. Although T-Swift has been rocking her sweet red lips for a while now, this high voltage shade reminds us of Christmas in the Big Apple! We can almost hear the pop star's pout screaming (or singing), "Welcome to New York!" If you don't feel like decking yourself out in sequins or wearing an ugly sweater during the holidays, than this is the ultimate way to showcase your holiday spirit and style. Before using Estee Lauder Pure Color Envy Sculpting Lipstick, be sure to exfoliate your lips so that the lipstick goes on smoothly! We love the Sugar Lip Polish by Fresh. Next, add a lip liner in a similar color to ensure that the lipstick stays put throughout the day and night. Then apply your lipstick, blot with a tissue and apply again. As for the rest of your look, let your red lips do all the talking by keeping the other makeup on your face to a minimum. Add a swipe of mascara and a bit of blush like Taylor and you'll be ready to blow kisses!